If you ever played contact sports outside during winter you know that body hits hurt so much more then. 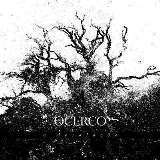 Portuguese O Cerco apply similar treatment on the O Colapso opener of their most recent EP A Desolacao. First they freeze the bones with guitar distortion and then begin hitting, slowly at first, but then pummeling mercilessly, so the pain is felt. Add voice, which is the sound any live creature would make when fiery forceps are applied to naked skin and you have some post-black avant-garde torture music the fans of Gnaw Their Tongues should appreciate. Thinking that you are now prepared for modus operandi, O Ocaso does not delay the punishment and goes into heavy hitting right away, the composition again dredging the depths, guitars being a horror show reflecting madness and depravity the way Blut Aus Nort do it sometimes, like a slowly descending hungry vulture circling above its prey. Closer title track takes on a slightly different approach plunging you first into a quieter cellar emptiness with similar distorted guitars. When drum beat comes in, but unlike O Colapso or O Ocaso, I can hear a distinct melodic progression in A Desolacao, nevertheless still hinting at some moody celebration of suffering.